Freight, Mail Innovations)now put your reference number -> fill the shipment Shipment Date Range ->Press the track button to get the status. Tracking through Email: For tracking UPS package via email you need to send the tracking number details to : totaltrack@ups.com.You can get the single tracking number result or for multiple tracking results up to 25 tracking numbers.just enter all the tracking numbers in the message body and send it. Importing Tracking numbers: Log in to your UPS account and import all tracking numbers from your computer to get instantly updated tracking result. Tracking through SMS: You can track shipment vis SMS From the Tracking Detail page, add SMS notifications by selecting Request Status Updates. United Parcel Service of North America (UPS) is one of the reputed logistics companies in the world. The The main headquartered American global package delivery company is in Sandy Springs, Georgia. Everyday UPS delivers more than 15 million packages to 7 million customers and all they have extended their business in more than 220 countries and territories all around the world. What does “Next Expected Tracking Event” mean in UPS Tracking? Generally, If your shipment is expected to be in transit more than a day, then UPS display the day and date of the Next Expected Tracking Event in the Shipment Progress area.No need to worry Next Expected Tracking Event means your shipment still moving and you will receive soon. Does tracking status on ups.com show the most up-to-date information about my parcel/package? Yes, UPS tracking system shows the most updated status to you.Whenever they scan for the new status they change with newly updated tracking status. My current shipment tracking status is “On Vehicle for Delivery”. when will I receive my shipment? On Vehicle for Delivery, the status indicates that UPS driver on the way and you can receive the item on expected delivery date.However, shipments are generally delivered anytime between the hours of 9:00 a.m. to 7:00 p.I am expecting to receive a package. Can I change my shipping address with UPS? I am expecting to receive a package. Can I change my shipping address with UPS? You can change your delivery address on ups official website UPS.com. You need to Enter your UPS InfoNotice number in the Tracking or InfoNotice Numbers field on the ups.com home page or the main Tracking page.Now select the Track button and On the Tracking Detail page select the Change Delivery button. Now choose Deliver My Package to Another Address option and fill in the required details to have your shipment delivered to your new address. How can I get proof of delivery for my package via Tracking? 1. first Log in to My UPS. 2. Select the Tracking tab at the top of the page. This will redirect you to the Tracking main page. 3. Put your Tracking Number in the input field. 1. UPS Internet Shipping: You can enjoy multiple tracking tasks including storing 2000address in the personal address book. 2. Enhanced Tracking: Save your time by storing up to 50 tracking number in tracking history.You can import or export tracking numbers. 4. Open a UPS Account: Your UPS account lets you bill your shipping charges and services. How to notify UPS that I don’t want to be contacted by telephone? You can request for Do not Call by contacting to this number 1-800-742-5877. UPS offers time to time online services for your domestic, international, or freight shipping. You can get all the details by visiting their homepage. What does “Order Processed: Ready for UPS” mean? Order processed mean UPS electronic transmission of the shipment details and billing information processed, once it goes with UPS network it will be updated. Normally How many days will take for my package to be delivered? Why wasn’t my package delivered in three days? UPS three days applies only for all business days, it excludes weekends, holidays, and any delays that occur beyond the control of UPS. Logged in to My UPS, select Shipping tab. Choose a UPS account number from the drop-down menu, then select Continue. Review the Ship to Information. If the shipping information is correct then Continue. Select the category from which you’d like to order. Select the quantity of the item. Select the Add button. To add more supplies to the order, repeat steps five through seven. Choose a UPS account number from the drop-down menu, then select Continue. Review the Ship to Information. If the shipping information is correct then Continue. 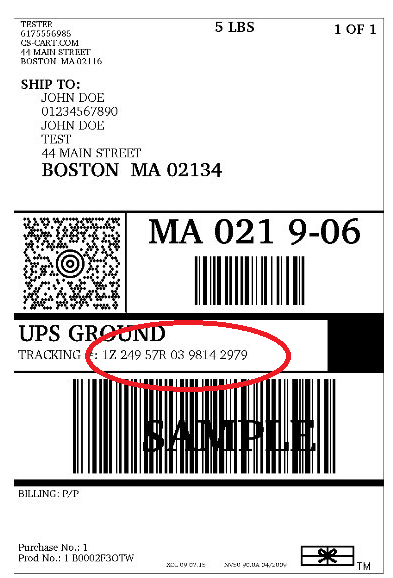 Tracking Number Format: The most common tracking number format of UPS is the combination of 18 alphabetic and numeric characters, usually starting with “1Z” (e.g. 1Z 8888 8888 8888 8888 ). There is some other format also which can be track in the same way. UPS invests over a billion dollars a year and technology automation.Technology is really a big part of their platform.Moving forward automated machines punctuate, the path of this labyrinth of conveyor belts that snake through the catch facility with little to no human intervention but that doesn’t mean they’re slashing headcount with automation.For UPS the information the flues with the package is as important as the package itself.Every ups parcel has a smart label which allows it to capture a stream of data ups harness.All those trillions of pieces of data into a thousand-page algorithm that’s essentially a GPS dashboard that predicts the future it’s called Orion on road integrated optimization and navigation.Integrating technology isn’t just about slashing its bottom line it’s also helping to ramp up employee performance those iconic brown trucks of the UPS.Over 200 sensors that they have on their vehicle, those sensors record everything from the time spent idling to the number of times a driver backs up while driving armed with the stream of income employee data from telematics supervisors will literally sit down with their fleet of drivers and talk through on-road driving strategy.Even as UPS ramps up plans to go high-tech the Atlanta-based shipper says.It plans to stay true to the bedrock of its brand ups in the business of hand delivering packages so those brown uniform UPS drivers on their doorstep are always going to be a staple. You need to visit UPS official website where you can see the live chat window to chat directly with experienced UPS customer care executives.You can now to the live chat page via this chat link. UPS email support is great and you will get a prompt solution from email support team.You have to use their email support form to submit your complaint.Visit UPS support page now to get instant help. For International Contacts you can visit UPS worldwide contacts page.